Fall is here. Kids are back in school. Thank goodness I am not. 20 years was enough. You and your children both need breakfast. These are a quick, tasty way to make sure that it happens every day. The protein, healthy fats, and fiber will keep hunger at bay and feed the mind. These are "Brain" muffins, my version of a bran muffin. The name comes from the high omega-3 content of these gems. Omega-3 fatty acids, specifically DHA, are essential for brain function. Walnuts and flax meal are both excellent sources of omega-3s. Preheat oven to 375 degrees. Mix together wheat bran, flax meal and buttermilk and let stand for 10 minutes. Beat together applesauce, egg, sugar and vanilla and add to the bran mixture. Stir together flour, baking soda, and baking powder. Stir flour mixture into buttermilk mixture, until just blended. Fold in 1/3 cup raisins and 1/2 cup walnuts and spoon batter into lined muffin tins, filling each nearly to the top. Sprinkle tops of muffins with remaining walnuts and raisins. Bake for 15 to 18 minutes, or until a toothpick inserted into the center of a muffin comes out clean. Cool and enjoy! Store in an airtight container. Zucchini season is here! The summer squash is slowly taking over our Farmer's Market. I did not plant any this year because I wanted to conserve my garden space-- and they only cost 25 cents this time of year. I really enjoy small-to-medium zucchini because I think that the peel has great flavor (and fiber). The flavor of this salad mimics a creamy cucumber salad. Fresh and delicious! You may cube your zucchini, but I really enjoy the ribbons. Makes me feel really girly. Like I should put on a party dress while I make this (instead of my gym clothes? As if!). *To peel ribbons: use a vegetable peeler to make thin strips down one side of zucchini until seeds are reached. Turn the zucchini 90 degrees (1/4 turn) and repeat process. Repeat until all sides have been peeled into strips and only seeded core remains. Combine zucchini strips, red pepper, and red onion in a medium bowl with a lid. In a liquid measuring cup, whisk together remaining ingredients. Pour dressing over vegetables and toss to coat. Place covered bowl into refrigerator and allow to marinate for 2-4 hours. Note: depending on the water content of your zucchini, some dressing may need to be drained before serving (or it may be too "soupy"). My mom used to make this cake when I was growing up. It was always one of my favorites and it reminds me of summer, when fresh raspberries are plentiful. It is SO easy! Thanks Mom for sharing! I love you! Preheat oven to 350 degrees. In a large mixing bowl, use a hand mixer to cream together butter, egg, sugar, vanilla and milk. In a separate bowl add flour, salt, and baking powder. Spoon dry ingredients into wet and mix until dry ingredients are moistened. Spray a cheesecake pan (a round pan with removable sides- a 13x9" cake pan will work as well) lightly with baking spray. Spoon batter into pan and cover the top of the cake evenly with raspberries. Bake for 35-45 minutes (somewhat dependent on pan), or until a toothpick inserted into the center comes out clean. While cake is baking, whisk together GLAZE ingredients. When cake is removed from oven, gently brush the warm cake with glaze (I removed the sides of my cheesecake pan to brush the sides of the cake as well). Allow to set for 10 minutes and serve! Heat wave in Montana this week! I LOVE it! After several days of 95 degrees, we needed some cold soup for dinner. What a terrific use for those garden-fresh tomatoes! In a small nonstick skillet over medium heat, add olive oil, garlic, and shallots. Saute until fragrant, ~ 2 minutes. Add brown sugar and 1 Tbsp balsamic vinegar. Continue to heat until shallots have softened and vinegar has thickened, ~ 2 minutes. Remove from heat and add to a large food processor or blender. To the processor with shallots, add remaining ingredients and blend until a smooth puree is formed. Transfer to a bowl and place in refrigerator to chill for at least 20 minutes but up to 24 hours (can be made one day ahead). Serve garnished with a basil leaf. There is not a single thing wrong with pistachios. They are delicious. Our friend Jeff really likes pistachios too. He refers to them as heroin. Once you start you cannot stop. He has no basis for comparison, but I get the jist. Pistachios are a very tasty nut filled with phytosterols, mono and polyunsaturated fats, and potassium. They also have the most antioxidant power of any snack-worthy nut with 7983 Trolox Equivalents per 100 grams. These are a terrific substitute for my pistachio ice cream addiction. Carefully separate egg whites from yolk. Tip: break each egg over a small bowl and separate white into bowl, making sure that no yolk follows the white. THEN transfer that white into a medium-sized mixing bowl. Repeat for 2 remaining eggs. This way, if you do have some yolk "seepage" it will not contaminate your other whites! Add cream of tarter to egg white and beat with an electric mixer until soft peaks form. Add sugar 1 tablespoon at a time and continue mixing until stiff peaks form. Add vanilla and beat for additional 30 seconds. Gently fold in chopped pistachios. Using a spatula, place meringue into a large ziploc bag. Seal bag with a small amount of air remaining inside. Carefully cut off one corner of the bag to create a 1/2 inch hole. Preheat oven to 200 degrees. Line two baking sheets with parchment paper and place a small drop of meringue under each corner of paper to help secure it to the pan. Gently squeeze meringue from bag to form drops 1 1/2" in diameter. Continue process to fill baking sheet, placing drops 1/2" apart. Place oven racks in middle 1/3 of oven. Place one baking sheet on each rack and bake for ~1 hour or until meringues are crispy and cooked through (they will crisp up a bit once set at room temperature). Remove meringues from baking sheet and allow to cool. Store in an airtight container (up to 5 days). This is a fantastic twist on a shrimp cocktail! The recipe is one that my friend Peggy uses often. Not only does it taste divine, but it is so PRETTY! She always serves it in this beautiful rectangular vase so that you can see all of the colorful ingredients. I have added scallops and changed up the cooking method a bit from the original. It has a Spanish flare without too much heat. Perfect for a warm summer day. Heat olive oil in a large skillet on medium-high heat. Add garlic and heat until fragrant, ~2 minutes. Place shrimp and scallops into skillet and continue to cook until centers are opaque (it is OK to slice one to check), ~5 minutes (depending on size of scallops and shrimp). Remove from skillet and cut tails off of shrimp, reserving 4 shrimp for garnish. Slice each shrimp into 2-3 pieces (~1/2" chunks). Slice scallops in half. Place shrimp and scallops into a large bowl. Place skillet over medium heat and add lime juice and zest. Scrape brown bits from pan into juice and allow to heat for 2 minutes. Pour lime mixture over seafood, and stir in onion and serrano chile. Cover and refrigerate for 30 minutes to marinate seafood (place the 4 reserved shrimp on top to find them with ease). Remove large shrimp and place in a separate bowl, refrigerate until serving. Stir in chopped tomato, olives and cilantro to remaining mixture. Refrigerate for 2 hours. To serve, stir in avocado (optional). Spoon 1 cup of mixture into each wine, martini, or margarita glass and place 1 shrimp on the side of each glass (make one small cut in each shrimp to place on rim, not all the way through). Garnish with a lime wedge. I finally got up the guts to health-ify my Russian Cream recipe. It's so good- but such a 20! This turned out light and fluffy and VERY tasty! Hallelujah for Greek yogurt! I may never make true Russian Cream ever again (kidding, only kidding). Our "local" cherries here in Montana come from the Flathead Valley. Farmers and fruit stands start popping up this time of year selling famous "Flathead Cherries". They are delicious and it is absolutely necessary that I purchase some every year. The tanginess of the cherries was a lovely addition to the almond-flavored panna cotta. Perfect for summer! In a nonstick saucepan, heat the milk with the sugar over medium-low heat, stirring, until the sugar is dissolved. Meanwhile, in a small bowl, sprinkle the gelatin over 2 Tbsp water and let stand until softened,, ~3 minutes. Scrape the gelatin into the warm milk, whisk, and let cool to room temperature. In a spouted mixing bowl, whisk the sour cream with the yogurt, lime juice and almond extract. Whisk in the milk mixture and pour the panna cotta into six glasses. Refrigerate until set ~6 hours. Combine pitted cherries and honey. Place covered in refrigerator. To serve: place ~1/4 cup cherries onto panna cotta and garnish with almonds (optional). This is inspired by my favorite smoothie recipe. Not the polenta. Just the spinach and blueberries. Talk about antioxidant heaven! We had this as an entree salad, but you could use smaller portions as a starter or a side dish. In a medium nonstick saucepan, heat olive oil over medium-high heat. Add garlic and saute until softened, ~2 minutes. Pour 3 cups water into pan and bring to a boil. Add salt and slowly whisk in corn meal. Reduce heat to medium and whisk continually for 15 minutes or until thickened. Lightly spray a 9x9" baking dish with cooking spray. Pour thickened polenta into dish and place immediately into refrigerator. Chill for 30 minutes. Preheat oven to 350 degrees. Lightly spray a baking sheet with olive oil spray (I used my mister). Remove solid polenta from refrigerator and turn out onto a cutting board. Use a lightly-greased knife to slice polenta into 1" cubes and place them onto the baking sheet. Bake for ~20 minutes, or until crispy and lightly brown (inside will remain lightly soft). Remove from oven and cool. Whisk all dressing ingredients together in a large liquid measuring cup. Allow to sit for 10 minutes. Place spinach leaves into a large serving bowl or plate. Add dressing (to taste- you may not use all of the dressing) and toss to coat. Garnish the salad with onion, blueberries, feta cheese, and polenta croutons. Eating healthy while camping can be difficult. Especially without refrigeration. I have a new-found curiosity for dutch oven cooking over the campfire. However, many recipes call for highly processed (highly-preserved) ingredients. I have wanted to try this recipe for a while, and I wanted to test it before I tried it camping (which would have left us food-less had it not turned out so well). Last Friday night was cool enough to build a fire in our fire pit in the backyard. I'm no Boy Scout (not even a Girl Scout) so I asked my hubby to stoke up a nice cooking fire for me. In my original recipe I used a long grain brown rice. But it took FOREVER to cook, so I have modified it to Minute Brown Rice. If you have FOREVER to let your meal simmer, you can certainly use the long grain brown rice, or use pre-cooked rice also. This recipe will be coming with us on our next outdoor adventure! Build a fire, and place a grate over one end of the pit, making sure that there is flame directly under the grate. In a large iron dutch oven, combine olive oil, onion, and peppers. Place oven onto the grate and saute onions and peppers with a long-handled spoon. Cook for 2 minutes or until softened. Remove oven from grate and add remaining ingredients (except optional sausage). Mix well, then cover oven and return oven to grate. Keep a flame under the grate while cooking. Bring mixture to a boil and cook for ~20 minutes, stirring every 4-5 minutes (you may remove oven from grate to stir). Remove oven from fire when rice is fully cooked and mixture has thickened. Add sausage if desired. Allow to cool for ~5 minutes prior to serving as it will be very hot! Serve with additional Tabasco sauce if desired. Lasagna is terrific. But who wants to spend their sunny days inside slaving away to make one? Not I. This is a delicious twist on a classic dish that lets you incorporate lots of your garden-grown tomatoes! No oven needed. Whew! LYCOPENE is the hot nutrition term used frequently when talking about tomatoes. This powerful nutrient may help prevent cancer! Organic tomatoes and tomato products have been shown to have higher concentrations of lycopene. All the more reason to harvest some of your own for this dish! In a medium saucepan, heat olive oil over medium high heat. Add garlic and saute until fragrant, 2-3 minutes. Add crushed tomatoes, vinegar, sugar, salt, parsley and oregano. Bring to a low boil, then reduce heat to a simmer for 8 minutes. Remove from heat and transfer sauce into a shallow glass container. Place in refrigerator for 2 hours. In a large pot, bring 12 cups of water to boil. When water is boiling, add tomato bouillon cubes and stir until dissolved. Carefully place lasagna noodles into boiling water and cook until al dente, ~9-10 minutes, being careful to not overcook. Remove from heat, drain and rinse with cold water. Cut noodles down the center lengthwise, then cut each half crosswise into four pieces (each lasagna noodle will result in 8 smaller noodles). Place noodles into a large bowl and add chopped tomatoes and basil chiffonade. Toss gently. To chilled sauce, add ricotta and whisk until combined. Add sauce to noodle mixture and toss gently to coat. Serve immediately. In celebration of one year of Eighty Twenty...I will be giving away some fantastic prizes in September to my loyal followers. I was going to give away some nutrition or kitchen-esque items. But this is more fun and it supports my homegirls. I want to give you a sneak peak. Shayla (as in the Shayla from Shayla's Indian Potatoes and Runner Girl Gluten-Free Snack Mix) is also a friend who is a very talented creator of fine fashions. Her specialty is hats (although I have also seen her create some fantastic pants out of curtain material). 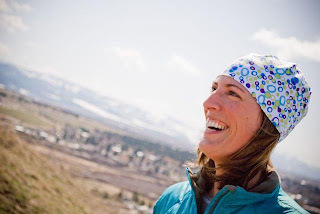 She is one of the creators of Sauce Headwear, which I wear continually throughout the cold Montana winters, especially while running and skiing. They ventilate your head but keep your ears warm. 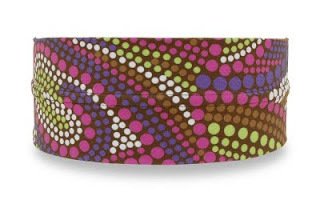 And they are SUPER CUTE with fun prints, which is not so common in winter headwear. This is my friend and hat model Heather. 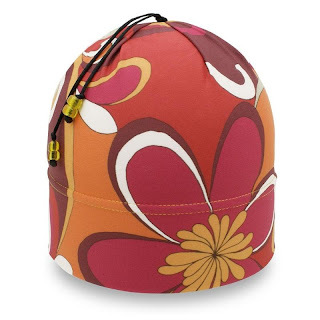 She rocks these hats as well. Sauce Headwear's newest fabrics (which I got to help pick out!!) are not online yet. But they will be by the time this giveaway happens. They will knock your boots off. Why not? I've been dreaming of these for a while now. Could it be done? My inspiration is from the Naked Truth Green Machine juice that my niece and nephew drink (they lovingly call it "seaweed juice"). I believe that you should not "hide" veggies in foods to get kids to eat them. But instead you should help them experience them in different combinations that may be appealing to them. Tell your kids that these pops have spinach in them (and dare them to NOT try them-- kids can't resist a popsicle). In a food processor, combine spinach and pineapple tidbits. Chop until smooth puree is formed. In a spouted mixing bowl or large liquid measuring cup, whisk together orange juice, apple juice, carrot juice and spinach mixture. Pour into popsicle molds and freeze overnight. I do like barbeque sauce. I think that you need one for every season and every flavor. Here is my Mexican version! It is spicy! Ole! In a large saucepan, combine salsa ranchera, red wine vinegar, brown sugar, Worcestershire sauce, liquid smoke, tomato base, chile powder, dry mustard, cumin, and garlic powder. Heat over medium high heat until simmering. Reduce heat to low. In a food processor puree red onion and diced dried chile. Add chiles and adobo sauce to processor. Puree until smooth. Add diced tomatoes and puree (you can leave some tomato chunks if you like). Stir puree into heated mixture. Heat over a low simmer for 20-30 minutes, until slightly thickened. Serve over an enchilada or with grilled or pulled chicken or pork. "The "Vitamin Water" brand is actually water, sugar and then synthetic vitamins added to that. No, they are not vitamins that come from real food, they are man-made synthetic versions. Synthetic versions aren't all bad. They are sometimes necessary and helpful for people with certain deficiencies. But the bottom line is that your body is fueled best by vitamins that come from REAL FOOD!" Holla Julie! No supplement can produce the same effects that you will get from the real deal! In a large glass container, add water, ice, strawberries and cucumber. Refrigerate overnight and enjoy!